Candy Apples recipe by Marium at PakiRecipes.com. 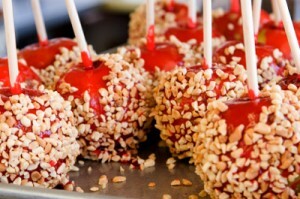 Candy apples are a classic treat enjoyed in autumn, especially around Halloween. This recipe tell you how to make perfect candy apples at home. In a saucepan over mediumlow heat, combine glaze and corn syrup. Simmer for 20 minutes. Dilute gelatin mix in hot water and pour in saucepan with glaze. Stir and continue to cook until temperature on a candy thermometer is between 180 and 200 degrees F.
Shove wooden candy sticks into bottom of apples, far enough to secure inside. Dip each apple in syrup and turn until completely coated. Immediately roll bottom half of apples in nuts. When cool arrange on parchmentlined tray.